Some people think that if they rank well for certain keywords there’s no need for them to worry too much about how they rank for their brand. While this is true sometimes, it’s important to understand that there are a lot of ways to outrank your competition, increase your sales, and make thousands of dollars more. Of course, rankings never tell the whole story. For instance, well-branded companies who don’t do well in the SERPs still get clicked on more often. However, the opposite also holds true: When you sell high-ticket items, people will pay more attention to reviews when deciding what SERP to click. Research unequivocally shows that companies with an established brand presence always get more organic traffic. Fixing your brand’s digital visibility issues will help your traffic and sales. Organic SEO is much higher with branded companies as well. This makes a good, solid case for the need for branding a company. Branding has to do with creating a company image that makes consumers prefer your product or service. The best way to understand this is to look at IBM. When you’re faced with the choice between this company and one you haven’t heard of, typically you’ll find yourself choosing IBM. This started several decades ago when the computer revolution was initially heating up. Many companies had inexpensive products that worked better than what IBM was selling. However, if something went wrong with one of these companies you could face a lot of problems. On the other hand, if something went wrong when you hired IBM people didn’t blame you since they thought IBM offered solid solutions. Although today’s landscape is different in many ways and people tend to look past name recognition, it’s still a major factor in buying decisions. Its exact impact varies from one segment to another, but it’s something that’s undeniably still there. With this in mind, you don’t want to take a chance on an unproven, unknown solution and neither to the customers you attract via your SEO efforts. As a SEO professional it’s important to understand that name recognition and consistent branding will help you provide better results. When there isn’t much name recognition in the beginning, you should get excited about the blank slate you get to work from. 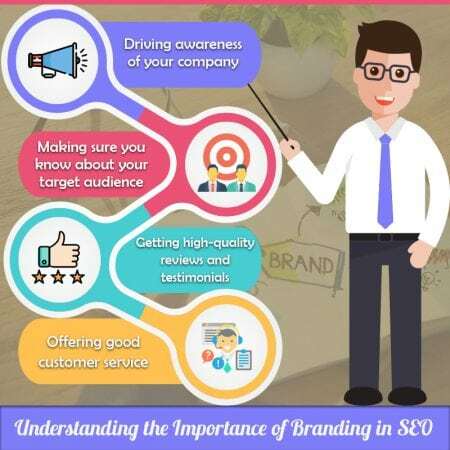 This is because search engine optimization is a great way to create brand recognition – especially when you’re working with products and services that consumers commonly search for. When you’re working to create brand awareness, you need to do your best to answer your consumers’ questions. Failure to do so means you’re not establishing trust in your brand. It’s your goal to make sure that every time a customer has an issue that you can solve, your brand’s name is seen. This way, when they’re ready to decide what to buy, they’ll come to you regardless of where you rank in the SERPs. This is why a #5 listing in the SERPs can perform as well as a #1 listing. Whether this means having your name said on the radio thousands of times or finding another way to get this same name recognition for your brand, it’s important for you to do so. This way when they go online and see your products and services there you’ll have a great ROI every time. Clearly, there’s a need to make sure that your company is well-branded. This is something that we at Local SEO Company can help you with. Since we understand branding’s objectives we can easily create a SEO presence for you that feels like it’s on steroids.